By the way, I got those iron bar stools at HomeGoods (love that place!) before I moved to Dallas in 2007. They were $20 each and had a gold flower in the middle of the back. I painted the gold flower black and added some $10 cushions I found at World Market. Five years later, I'm still a big fan (especially knowing what I paid for them!). But I digress... If you keep walking past the kitchen you'll see our server and empty eat-in area. Pretty barren, huh? This is one of the problem areas in our home. Our old home only had room for a formal dining area, but now that we have extra space, we have nothing to fill it. Extra space is generally not a problem, but it is for me because we're renting. Since I know this won't be our forever home, I'm afraid to make a big purchase on a dining set and then have it work well in our next place. And speaking of empty spaces, we also have one above the server. But at least for this one I have a plan! 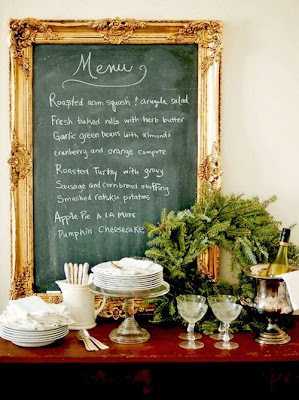 I am currently on the hunt for a large, gold-framed chalkboard like this to fill the space. Isn't this lovely? I think it would work perfectly in our space (and our next home). So that's it. That's our eat-in area we don't eat in. Up next on the tour will be our kitchen.